Even a child with a generous spirit can have an incredible impact on God's Kingdom. If you have never heard the name Hattie May Wiatt, don't be too surprised. Hattie was a young child who lived during the late 1800s and attended the famous Temple Baptist Church in Philadelphia pastored by the equally well-known Russell Conwell. Hattie's story is one of importance to the Temple Baptist Church. Through her act of simple generosity, she singlehandedly encouraged the church to grow and construct a new church building. The story goes that one Sunday, Hattie was found outside the church crying because there was not enough room in the Sunday School for her to attend. Pastor Conwell placed her on his shoulders and carried her through the waiting crowds into the church. She then began saving her pennies to build a larger Sunday School. She had saved only fifty-seven cents when she contracted diphtheria and died. Her parents gave the money to Conwell with an explanation of her reason for saving the money. The 57 pennies were later used as the first down payment for the Broad and Berks building. Hattie's picture can still be found on the wall of the Children's Sunday School room. This story touched Pastor Conwell so much that he repeated it many times. 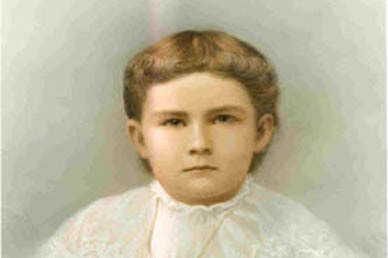 The Wiatt Mite Society was formed to carry on Hattie's dream. The society continued for many years. In September 1887 at the Centennial celebration of the United States Constitution, money received from the Wiatt Mite Society was given "for the success of the new Temple." If you don't have a lot of money, don't assume that you can't make a difference in your church, community, and the world. Be faithful in the "pennies," just like Hattie, and allow God to bless and multiply your little for the Kingdom.